I'm sure all girls would agree that your hair is really crucial in how you look overall! That's why we spend so much money on it no? 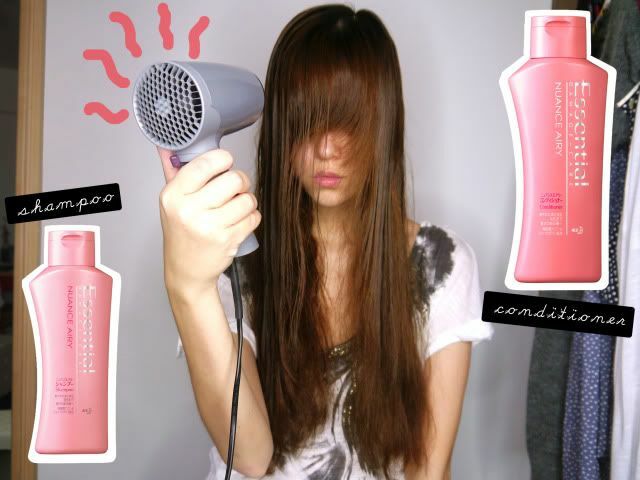 Perming, straightening, dyeing... all the stuff we do to our hair to make it look good can also end up damaging it! My hair is probably longer than average, so maintaining it is quite a hassle. super mega frizzy & flyaway. It's a problem I've had with my hair for many years, although I don't actually face problems with tangles. 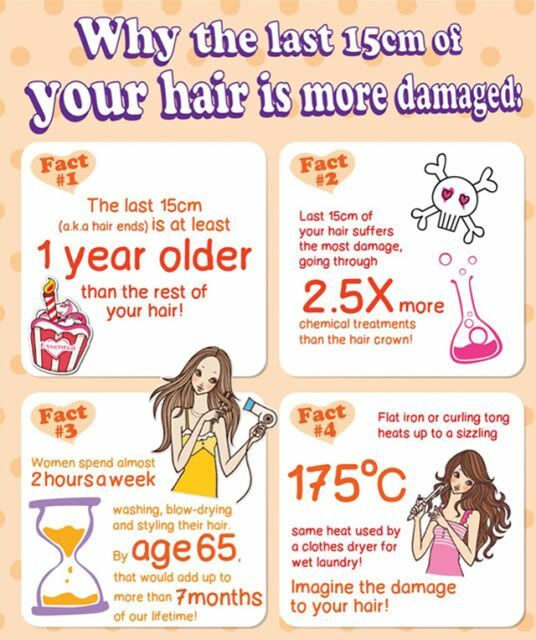 The last 15cm of your hair is where the damage is the most obvious! As the hair at the end is naturally a lot older, it has gone through the most damaging procedures. And I don't mean just hairdressing/salon stuff - every day the environment is attacking your hair and plus, many girls usually blow-dry and curl/straighten their hair daily. The heat from these can really dry out your hair and make it brittle, all while removing moisture. ... so that's why I'll be entrusting my hair to Essential! They focus on effective hair repair, and this is not limited to girls who only dye/colour their hair - everyone's hair is damaged to a certain extent so this is suitable for all users. 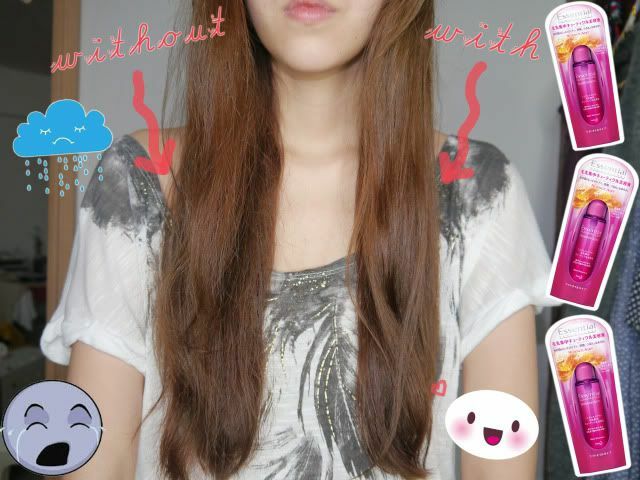 So first I used the basic Shampoo + Conditioner! You're actually supposed to use conditioner daily, which I didn't bother to do previously. 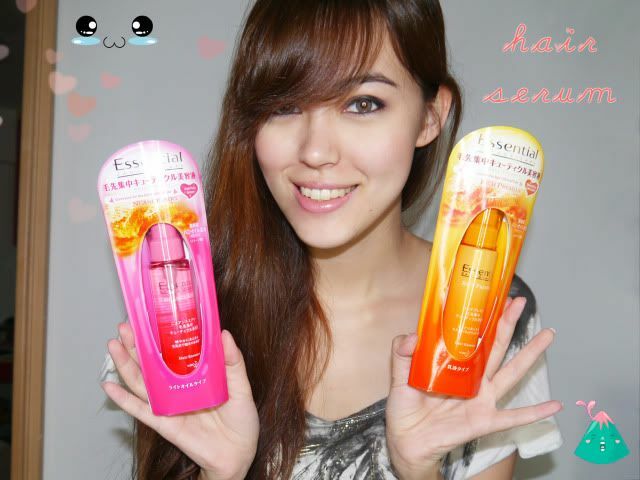 (+) Their products have an awesome smell! Hehe it smells sweet. And yes... I'm still blow-drying my hair LOL. I can't wait for it to dry naturally because it takes ages. Plus I especially need to blow-dry my fringe; if I let it dry on its own it decides to take a trip to the other side of my forehead or something. So to counter the damaging effects of blow-drying I used the hair essence! The difference is very obvious! The side with the serum quickly becomes a lot smoother and "condensed" (haha that's how I think of it). It appears a lot neater and makes the hair more manageable if you want to style it afterwards! The products are all suitable for damaged hair as a whole, but seeing as how the last 15cm gets the most damaged, that will be where you'll really be able to see Essential work its magic! The serum should be applied from mid-length to the hair ends, but lol... I figured my hair's frizz is jialat throughout so I applied it to the top area as well! Tip: As with all treatment products, avoid applying it to the scalp/roots because you don't want to end up with an oily scalp! I have a very neat look here, but you can easily adopt a different hairstyle! The serum just makes it easier to handle your hair and plus it repairs your hair's surface so it's good to put it on before going out. 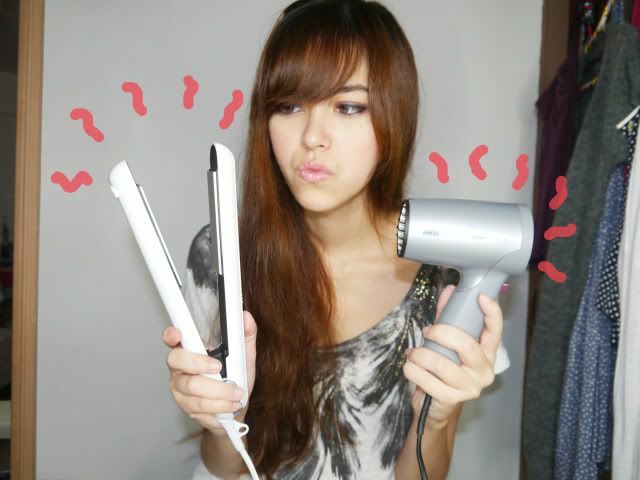 *to get light & bouncy hair! Both series contain High Purity Honey (adds moisture) & Shea Butter (soothes dryness, repairs breakages and mends split ends). 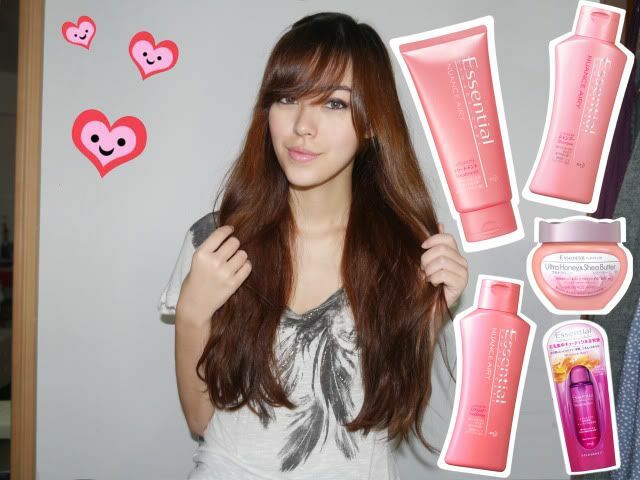 The main focus is all about nourishing your hair! The one I use/prefer is Nuance Airy! For me I don't really have issues with tangles, so I would rather focus on getting more volume & bounce into my hair :) It always looks very meh when it's so flat. 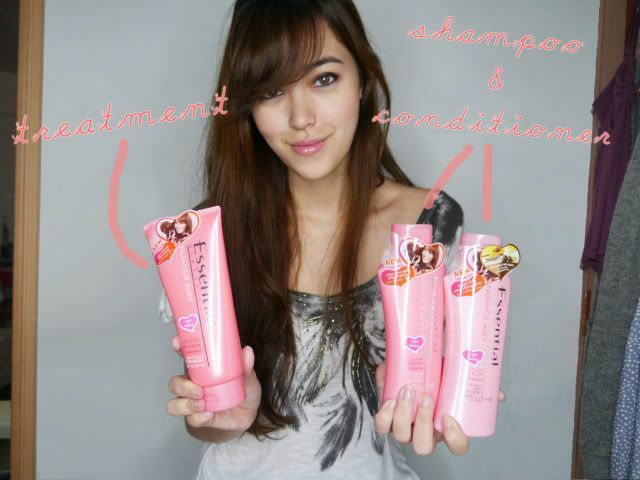 Shampoo & Conditioner - They have a deep moisture formula and should be used daily! Hair Treatment - It is (2x) stronger than the conditioner and contains cuticle repair essence. This should be used once/twice a week to further boost the nourishment and repair of your hair! Apply it right after rinsing out your shampoo. You don't need to use conditioner on days that you use the hair treatment! The hair mask is for severely damaged hair! This should be used once/twice a week as well. Tip: Apply the hair mask for 3 consecutive days both before and after chemical processes such as perming or dyeing so as to lessen the damage done to your hair! And lastly is the hair essence/serum I showed earlier on! This has the same moisturizing ingredients, but also helps to repair hair cuticles, protecting your hair while nourishing it as well! It is highly recommended that you use this daily because it not only protects + repairs your hair, it also helps to flatten the frizz & dryness! Nice hair doesn't come easily! I need to improve mine too. 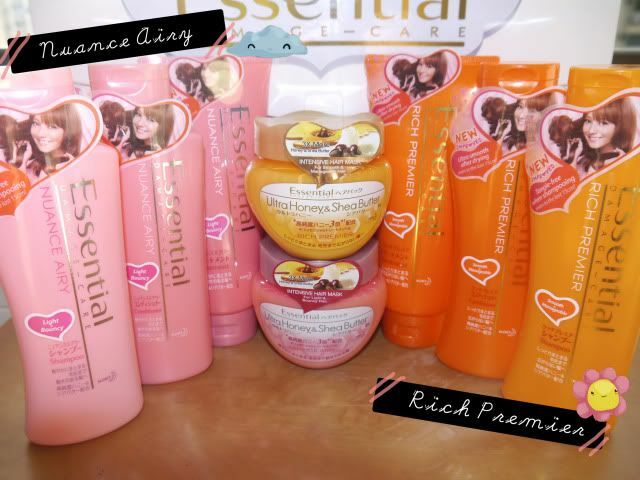 Essential is suitable for all types of hair since it both repairs & strengthens :) Even if you have short hair you can use it!